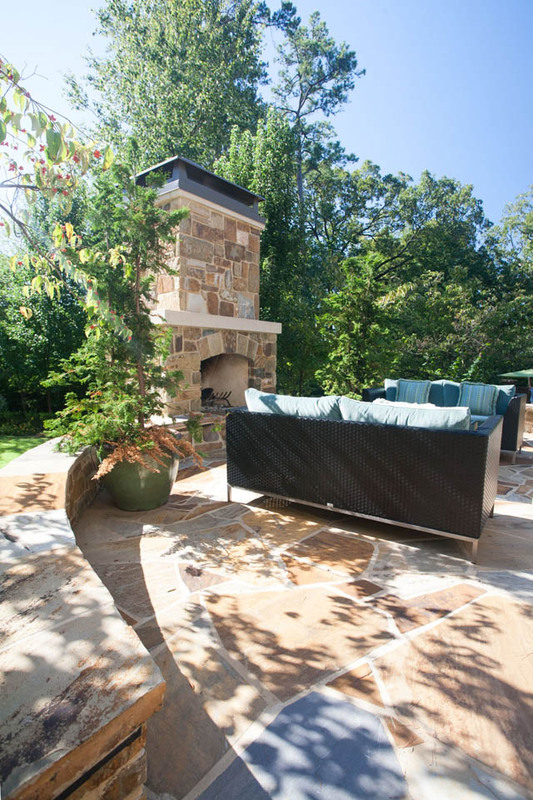 A landscape, no matter its size, is not just one contiguous area filled with growing things or concrete. It is divided into ‘rooms,’ which can contain different elements according to use, space, and growing conditions. 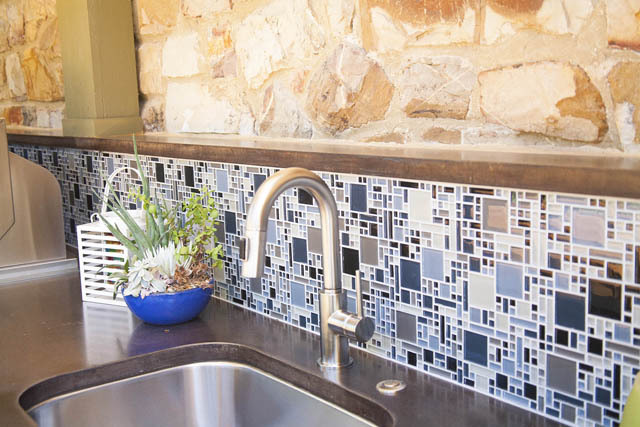 And even if you live in a smaller space, you can still bring in some great—and personal–design to that courtyard, or corner. Creating something unexpected is the point, and it’s not hard at all. Here, you see a typical garden wall and gate. 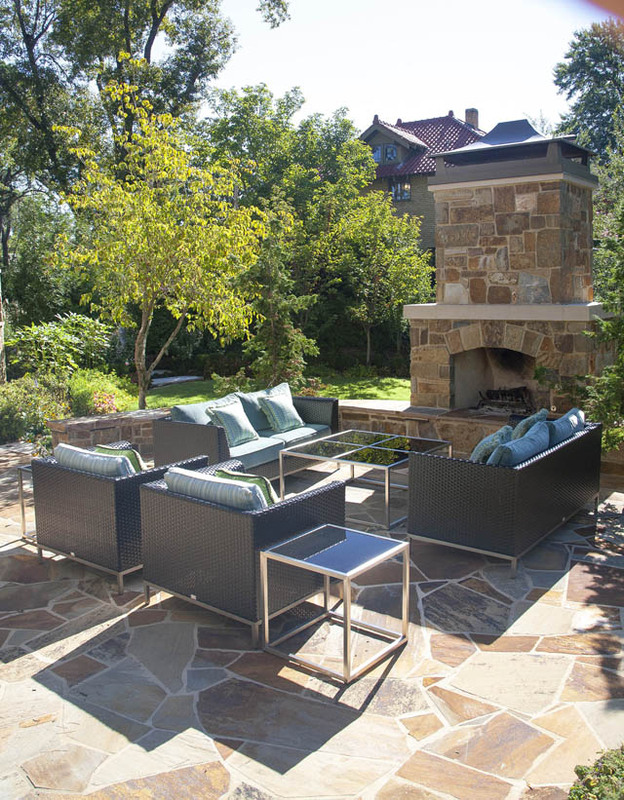 Functional design, varied and hardy plantings, lighting and security in place. Ho hum. But see past the gate? What lies within is key. It’s a small space, so an easy design. 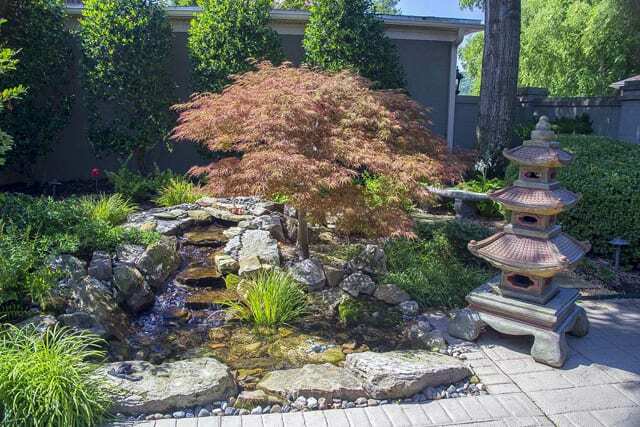 We used Chinese elements here, installed fairly simple plantings, provided a water feature for real interest, and an imposing pagoda to anchor it all. Design theme, water, plants, architectural element, rock and stone. That was the checklist. Notice it isn’t a long list of requirements. 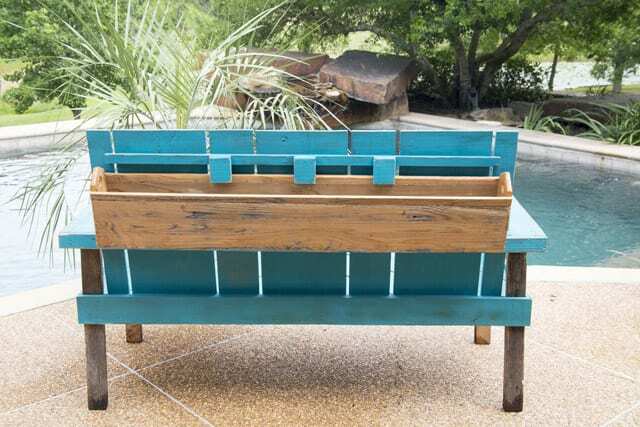 Start out with one connecting idea, then implement it with plantings and other elements. Because it’s a small area, we wanted to make use of sound as well as sight. Hence, the flowing water. 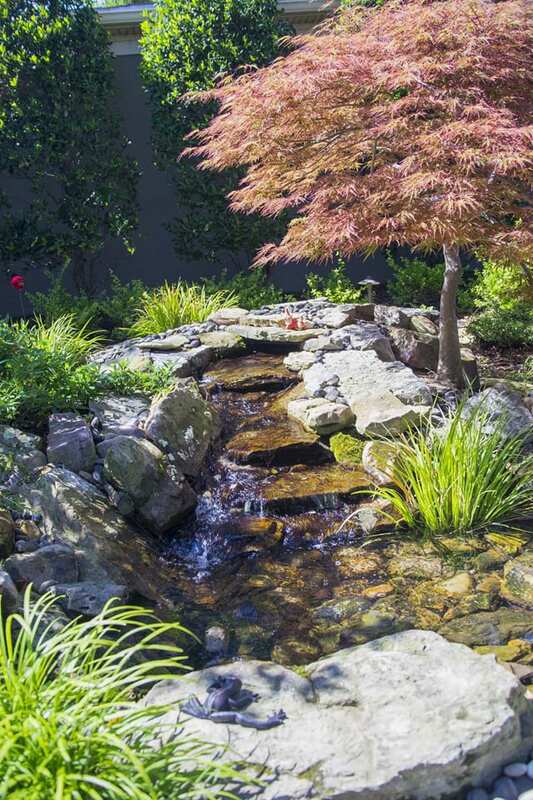 It cascades down the rocks and collects in a pool at the base of the Japanese maple. That maple is the workhorse of the design because it gives a great show twelve months of the year. The foliage of these small landscape trees are what gives them value. You’ll find hybrids with leaves that pretty much run the color wheel between black red and pale chartreuse. Even in the depths of winter, a Japanese maple’s trunk and bare branches provide interest. 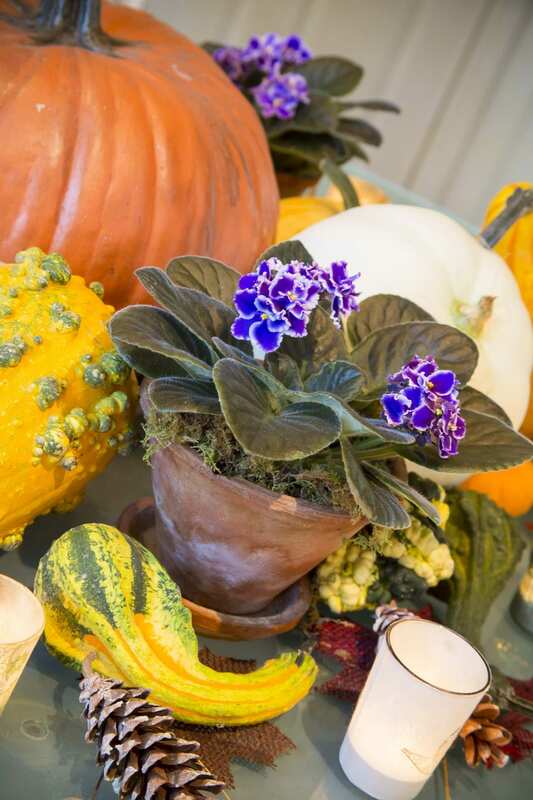 It always works in corners and small spaces because, depending on the cultivar, will never outgrow its space. Use of a small tree with brilliant foliage also meant we didn’t have to rely on annual plantings for color, which further simplifies the design. Just some water-loving grasses were all we needed to finish this part of the design. 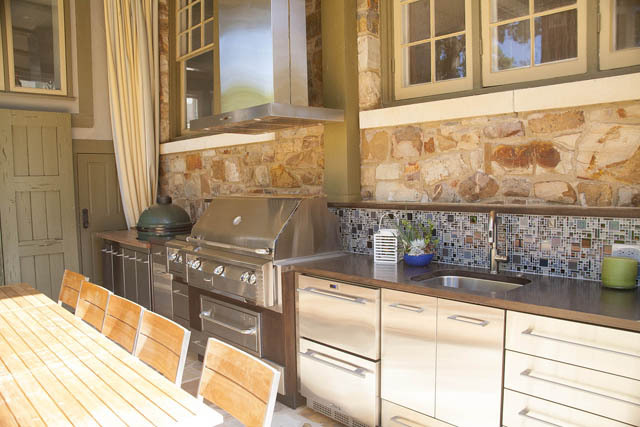 Contrast, which you’ll want to be aware of, comes in the use of natural rock slabs, river rock, and pavers. 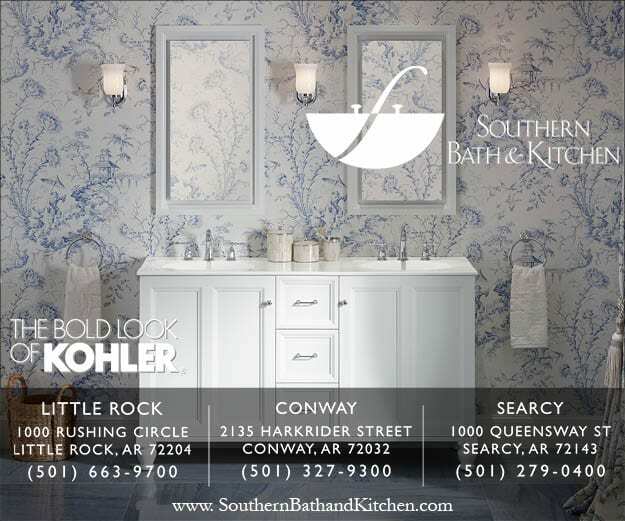 Don’t forget to incorporate texture into your design. Natural juxtaposed with manmade, straight lines versus what’s found in nature. And the best kind of contrast comes with the interplay of light and shadow. The kind of shade cast by elements of our small garden means it looks great at 6 AM, as well as 6 PM. 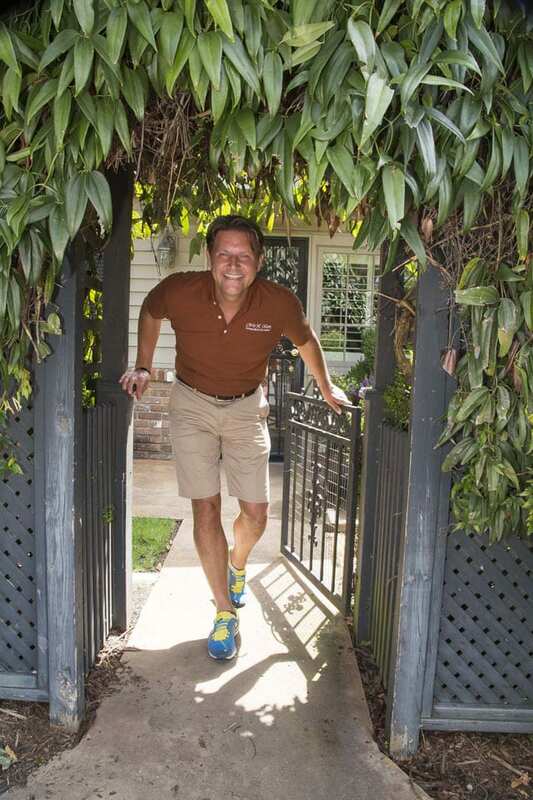 A touch of whimsy is always welcome. 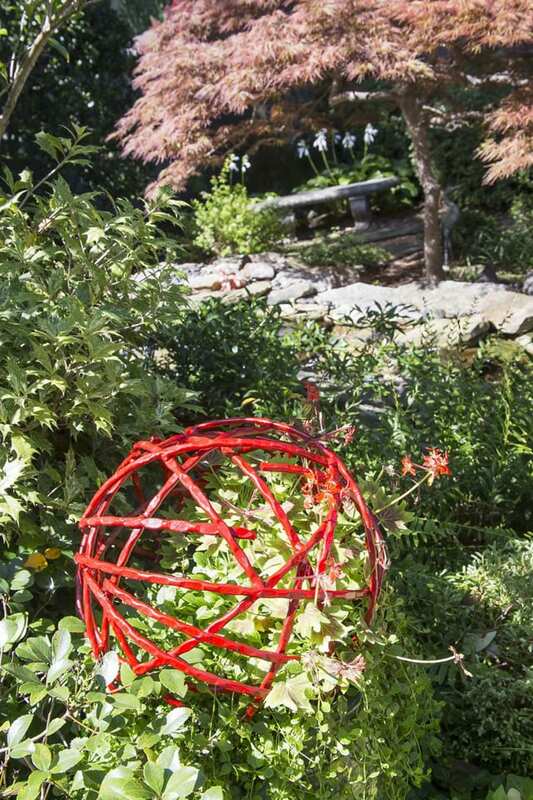 This globe was used because the fire engine red color can be seen from afar, and is merely the outline of a circle; the plants can grow through and over it. 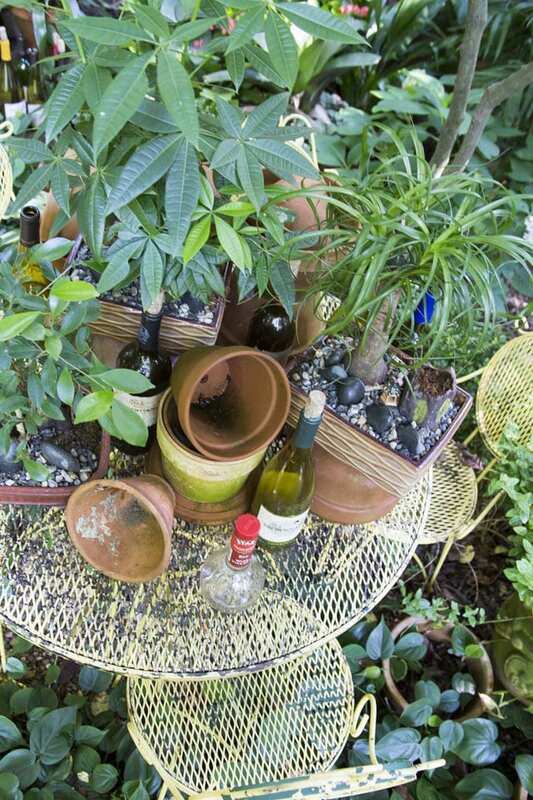 Let your plants run free every time you can, but give them something in the way of support. 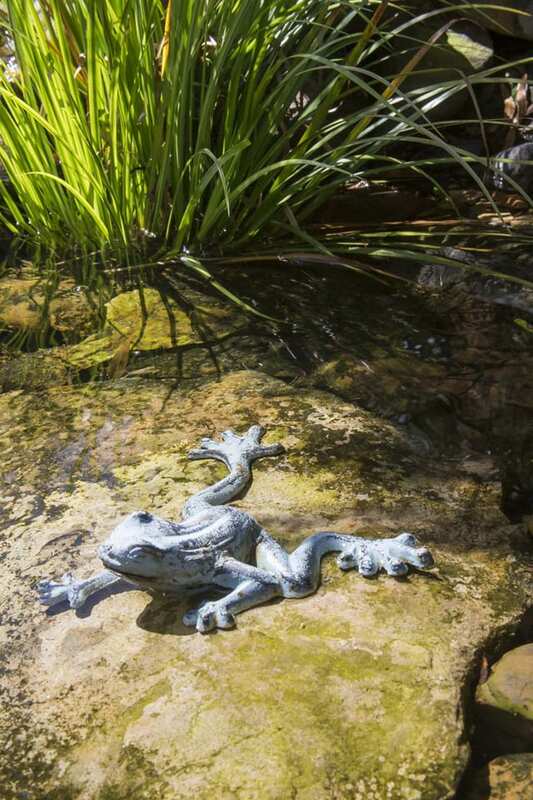 Pools call for frogs, and this one’s no exception. Stylized and amusing, he splays out on the rock sunning himself, and adds that element of personality you’ll want in your design. I write a lot about showing your personality in the landscape, but that doesn’t mean you have to create a major production and spend a lot of money. 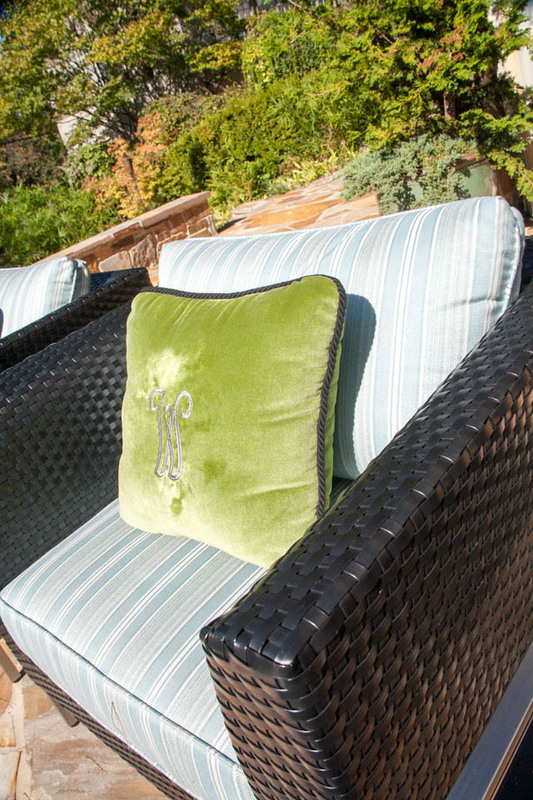 Often, just one element, like our metal lounging amphibian, will do the trick. 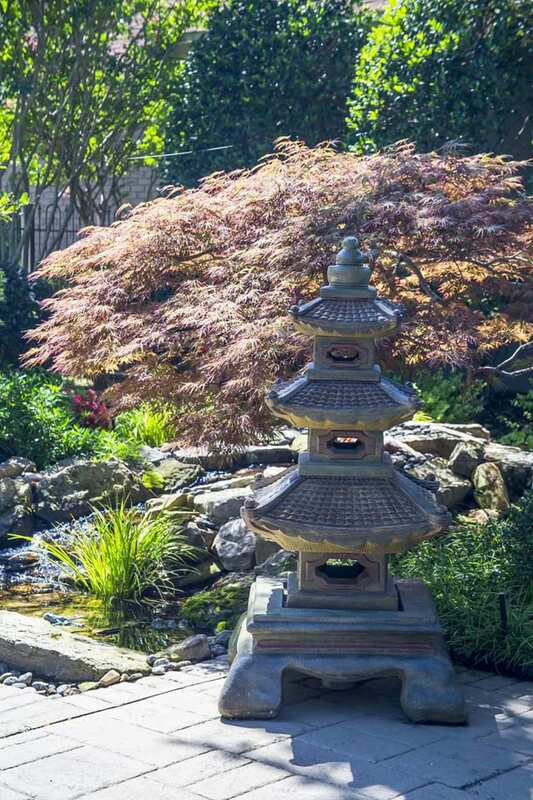 The stone pagoda adds gravitas, yet also a bit of fun. Plus, it telegraphs the importance of Chinese elements in our design. 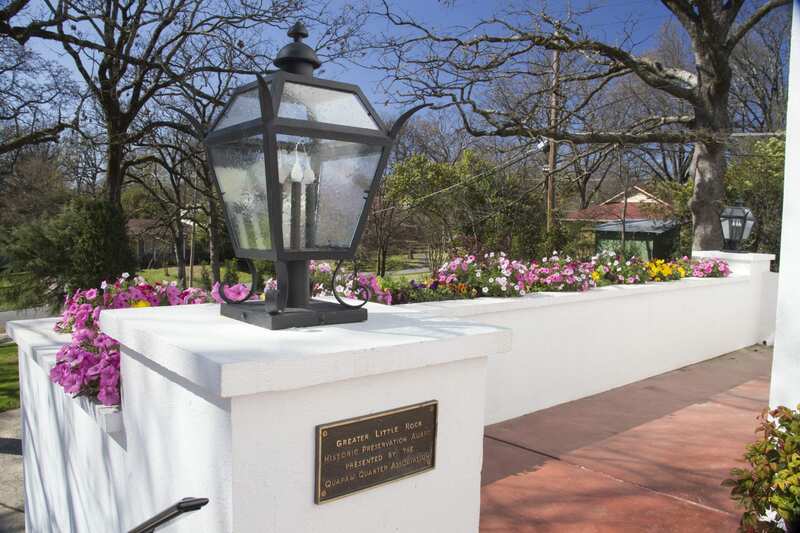 It anchors the space year-round and, while formal, is welcoming. 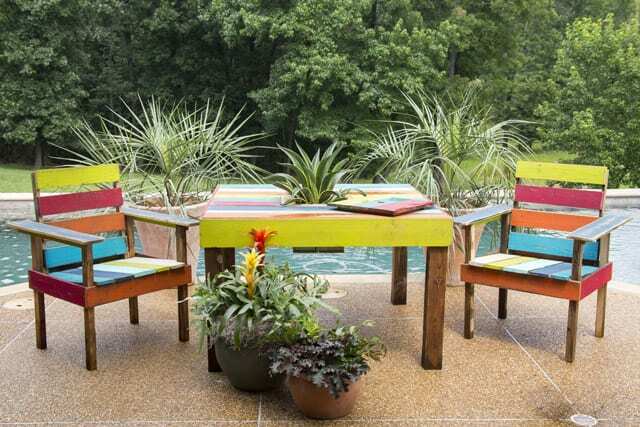 Find one large piece to serve as focal point like this one, and your design comes together. You can design a small garden around something you already have, or you can look for something as you go. 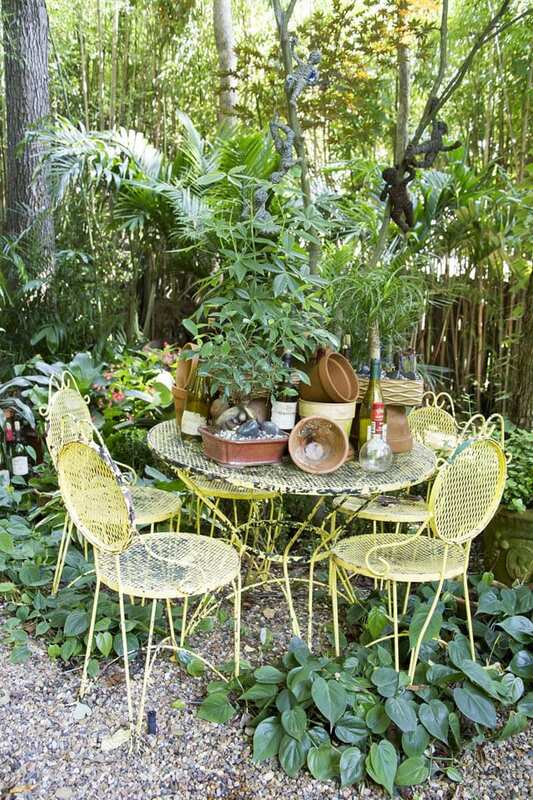 It’s really fairly simple to put together a small garden in a small space. Limit your design and its elements. 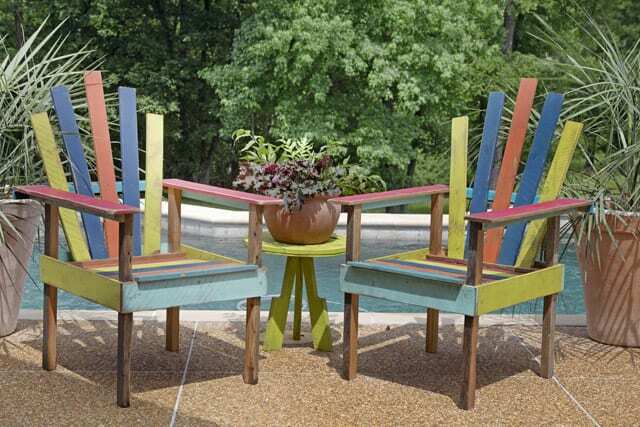 Think functionality, but don’t forget whimsy and the occasional piece that will delight you and your guests. Don’t be afraid to experiment. After all, you aren’t creating a five-acre park. 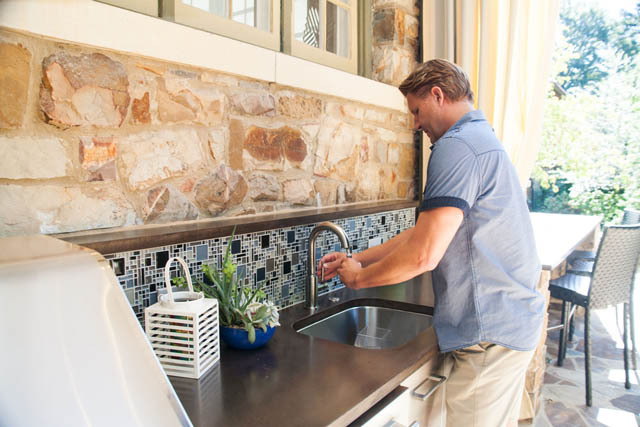 Think of it more as an inviting little space where you make unexpected use of what you can find all around you. 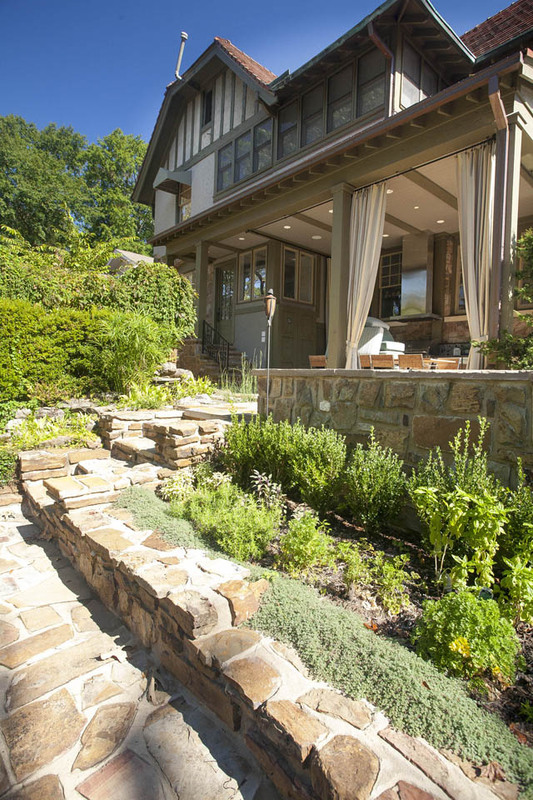 Ever notice how, often, the yards and gardens you really like seem to incorporate more than blooming annuals, stately perennials or swaths of grass? 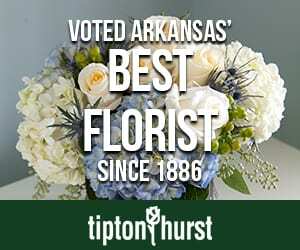 That’s because they do have more than simple plantings. They have small—personal—additions that make them stand out. 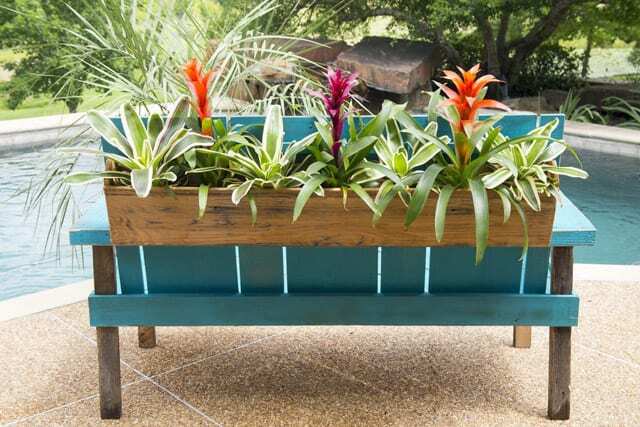 It’s the little things that can make your plantings fresh and interesting, and also express just a bit of your personality in the process. Yes, everyone waters with an automatic sprinkler system or hose, so it’s nice to see that old-fashioned metal watering can still make its appearance. If you don’t own one, you can source them many places, either still-functional or timeworn. It’s not about their use. It’s about them adding a quaint quality to a border or pot grouping. 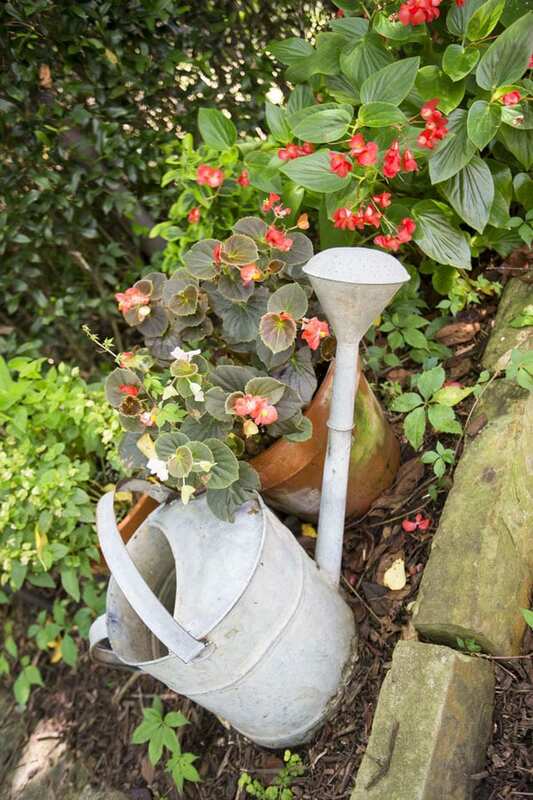 The fact that a watering can left among growing plants, and out in the weather, can also be turned up to water that wilting begonia, is a plus. 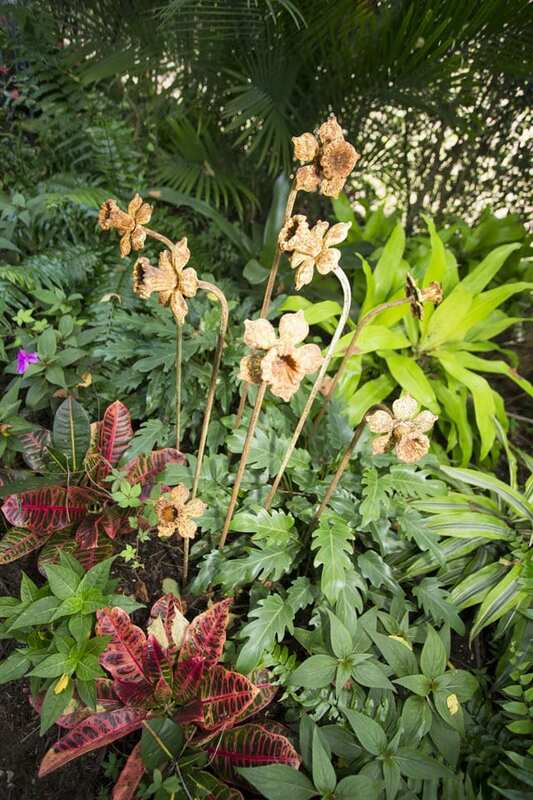 See the faded antique metal daffodils poking their heads above this mixed shade bed of foliage plants? I found them in a vintage store in Dallas and, because I was flying home, had a friend bring them in his car later. When you take a vacation or business trip, always be on the lookout for such objects. 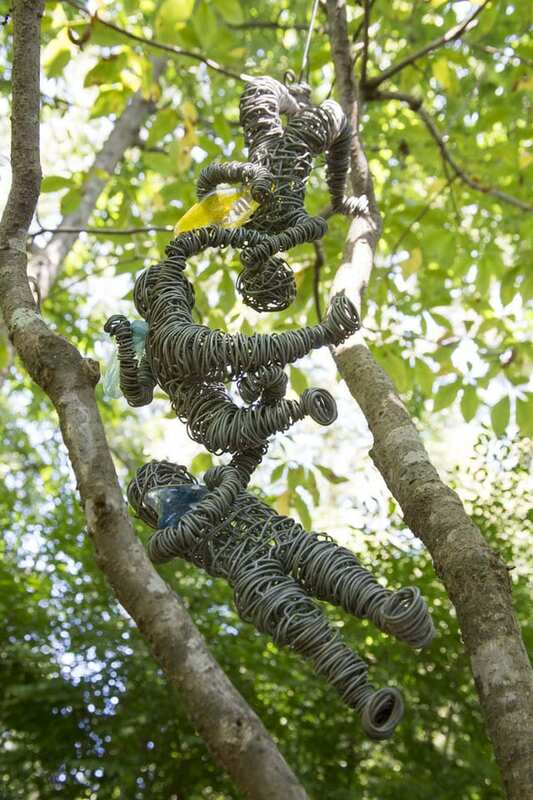 Not only do they add that unexpected whimsy to your garden, they are dear to you just because there’s a story behind them or their acquisition. And they are not something picked up at a big box store, either. I don’t know what their original use or site was, but they look like they’ve been blooming in my yard for quite a while. And who needs a shrub for height when you can have these lovelies? 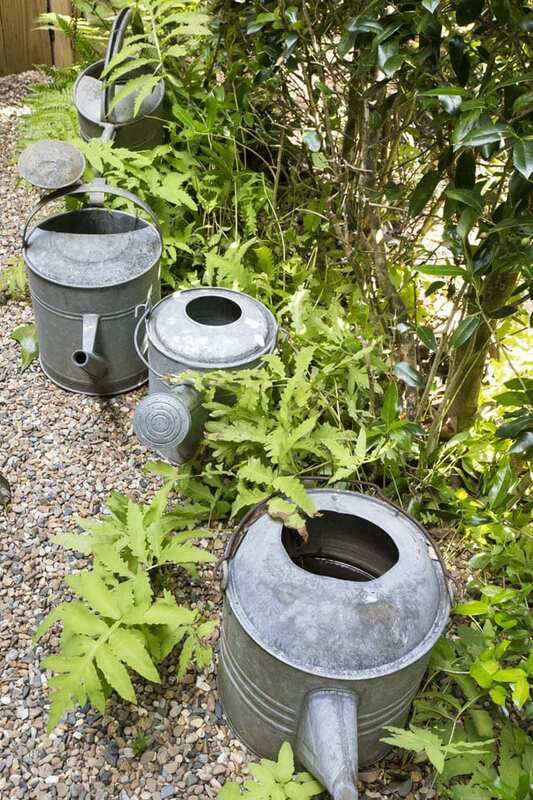 A phalanx of watering cans marches to its own beat, nestled among ferns that have naturalized along the gravel path. Why have one can, when you can have several? A good rule to remember: using more than one of the same item adds strength to your design. 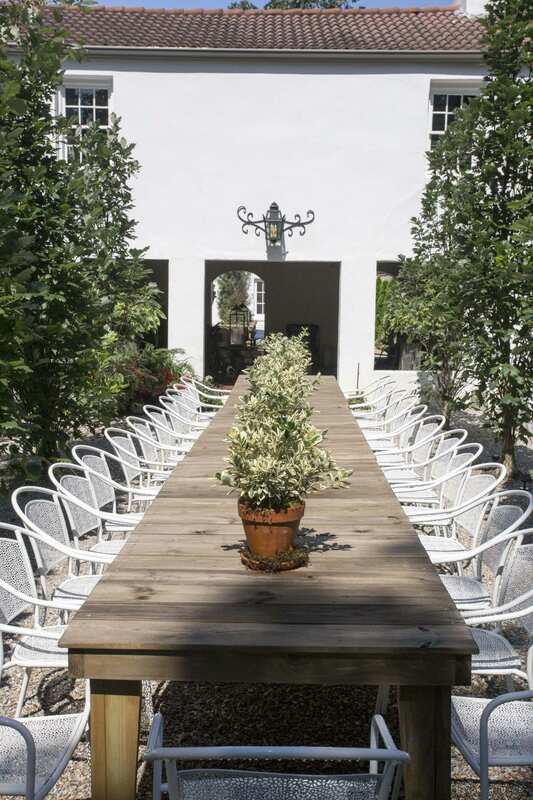 If you have a tree in your landscape, you just might need a table beneath. 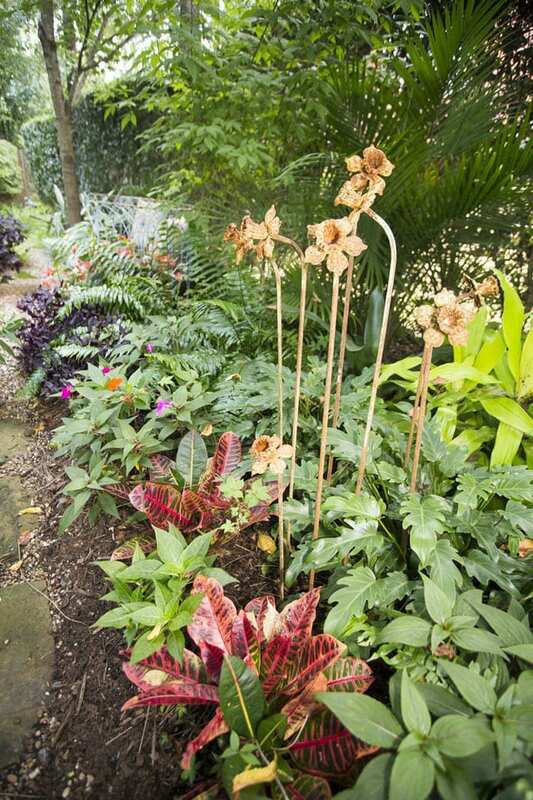 Often, we set up our gardens solely for the plants, and provide paths to get close to them as a sort of afterthought. 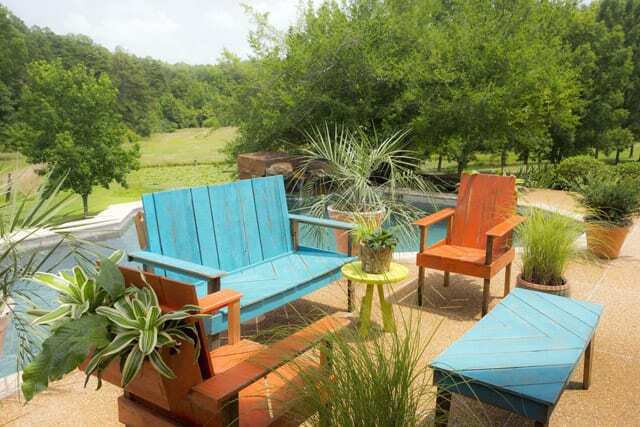 But don’t forget your guests and a vantage point for yourself, so all can sit within what you have created. 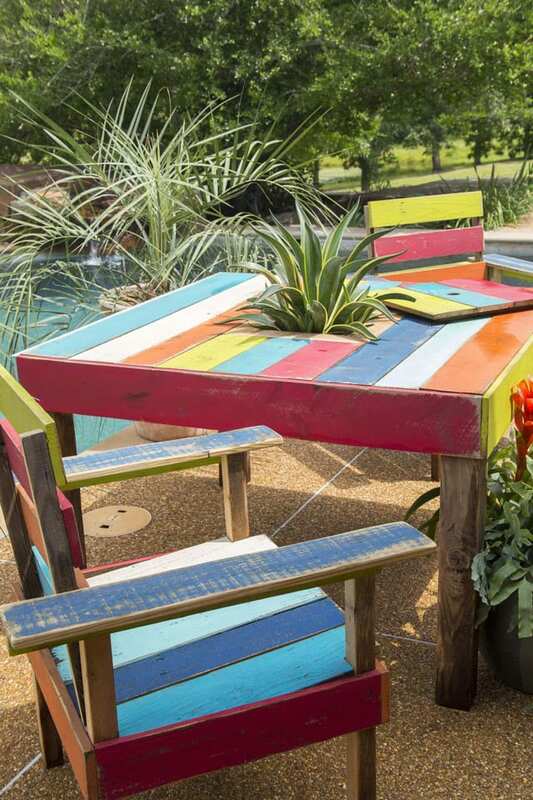 A table that can withstand the elements is apt, and then you can stack it with whatever you wish. I found this table on someone’s curb, waiting for the trash pickup. A coat of paint, and I wheeled it into place, under this mature tree. Functionality is good, but improvisational design is better. (Meaning, don’t worry too much about table surface area. Just so long as there’s room for you slide in, maybe with a cup of coffee and the newspaper, it’ll be fine.) I used weathered terra cotta pots, spheres and glass bottles bound for the recycler, plus a couple of plants I already had potted up. Looks like it’s been here a long time, doesn’t it? And to get to it, you get to hear that delicious crunch of gravel underfoot. 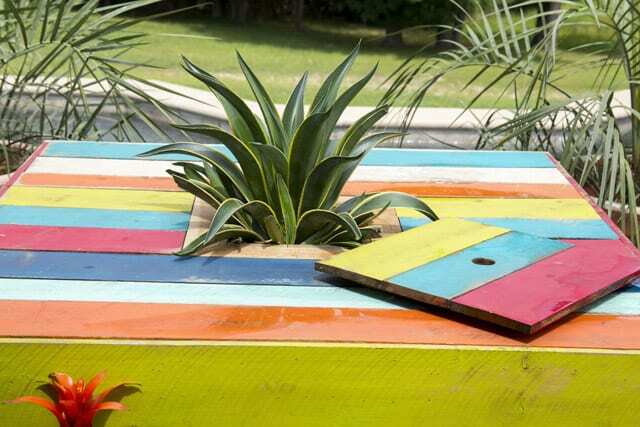 Think texture with your design, not just plants. 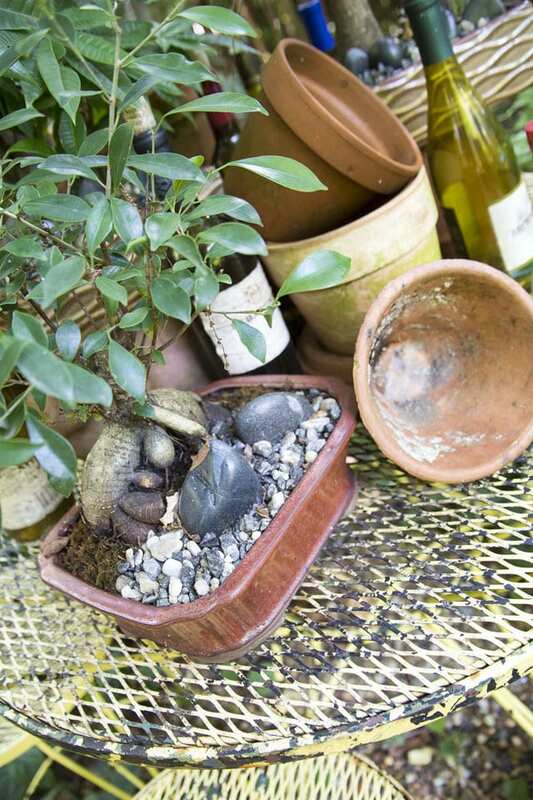 The bonsai ficus, from my collection, is perfect scale for the table, and I tossed in interesting rock and pebble, along with overturned lichen-encrusted terra cotta. An what better to hang above than wire acrobats? I found this tribe of metal people at Pike’s Market in Seattle. Yes, I had them FedExed home. How many times have you seen an ordinary wire basket of fern hanging from an overhead limb? These acrobats are a nice—and unexpected—touch. 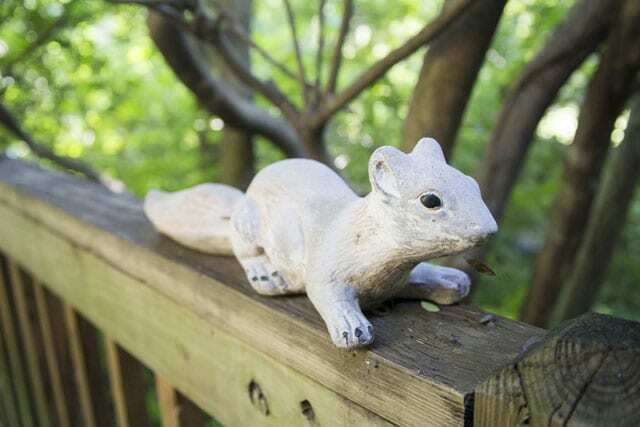 Squirrels run rampant in all our yards, but this painted concrete fellow is an import; I brought him home from a trip to San Diego. He’ll always be ready to dash up the deck railing. While on a trip, if you encounter something unexpected that really speaks to you, I encourage you to bring it home and find a good place for it. And that good place doesn’t mean the garage or attic. 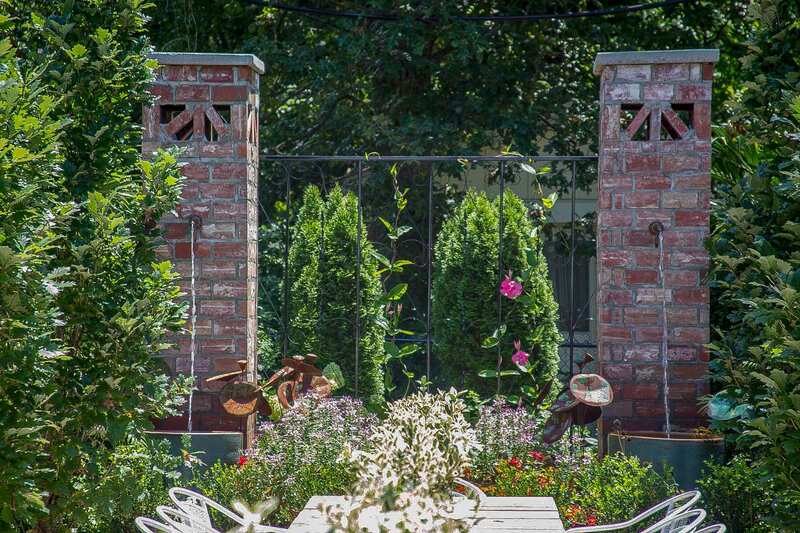 What can make your garden design special is not always the plantings themselves; it’s also what you add and blend and meld into them along the way. Little things can make big impact. 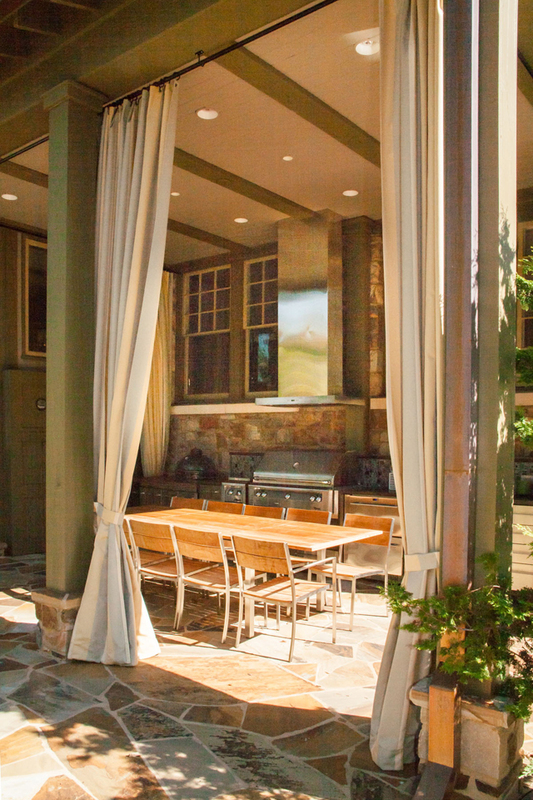 For several hundred years English landscape designers have advocated that gardeners should plan their spaces and utilize boundaries to create ‘garden rooms,’ which create senses of discovery and delight. 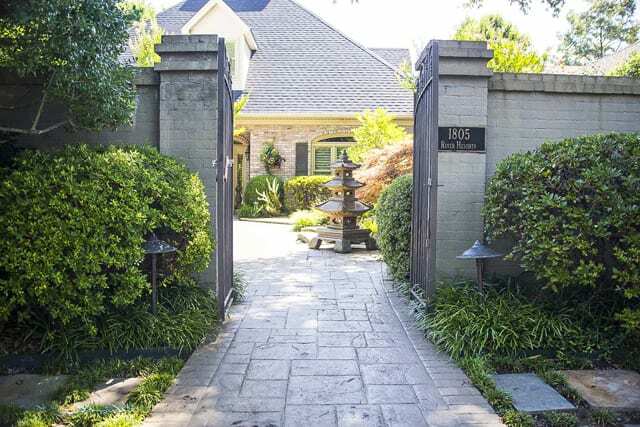 The problem with directly translating their ideas to American landscaping is that we usually don’t have acreage with which to play with, or budgets that allow us to hire someone to prune all those hedges and boxwood menageries. But the idea of utility—think kids playing out in the yard—can also lead to good design ideas, and even a bit of playfulness in the design. An arched entry begins the architectural aspect of this design, and immediately conveys that your design is both personal and functional. 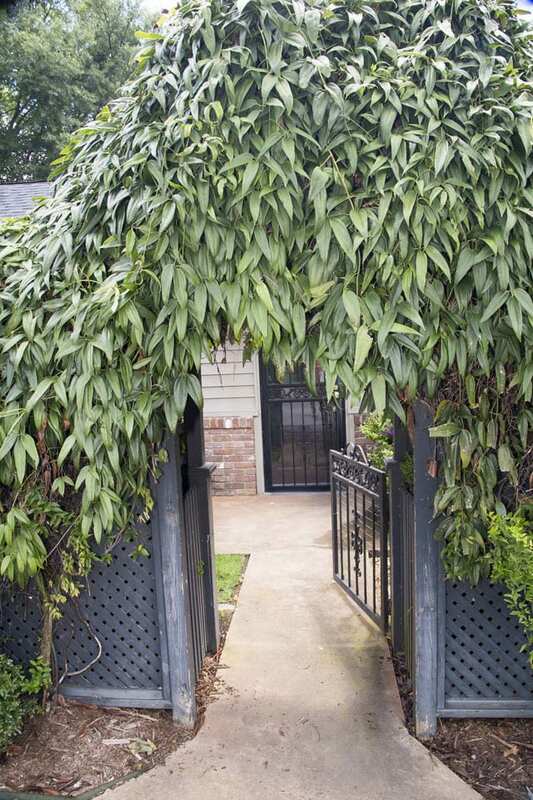 If you have a garden gate already, all you have to do is find the right plant material that will grow over the entrance and become a green archway. We used a variety of clematis here because it has a great bloom, but even better, wonderful overlapping foliage. It provides both definition of the space and serendipity because, while we trained it to arch, we let it be itself, vigorous and asymmetrical. Here’s where the ‘room’ idea really comes into play. You have young children who need a play space. 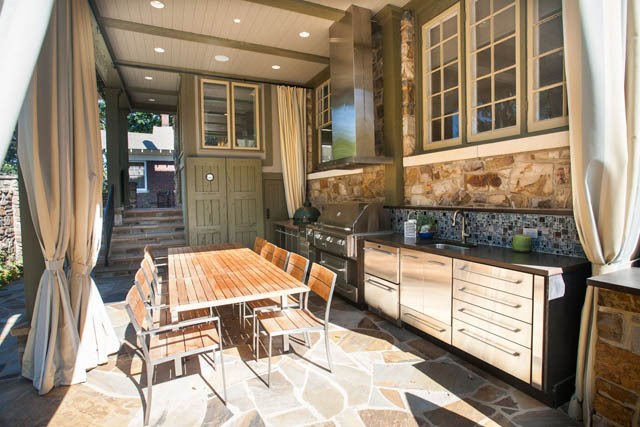 Why not use the backyard, but make it really functional? No sense in trying to nurture sod; it’ll be trampled to dust. So use pea gravel instead. Weathered, rounded gravel is much easier on children’s knees. 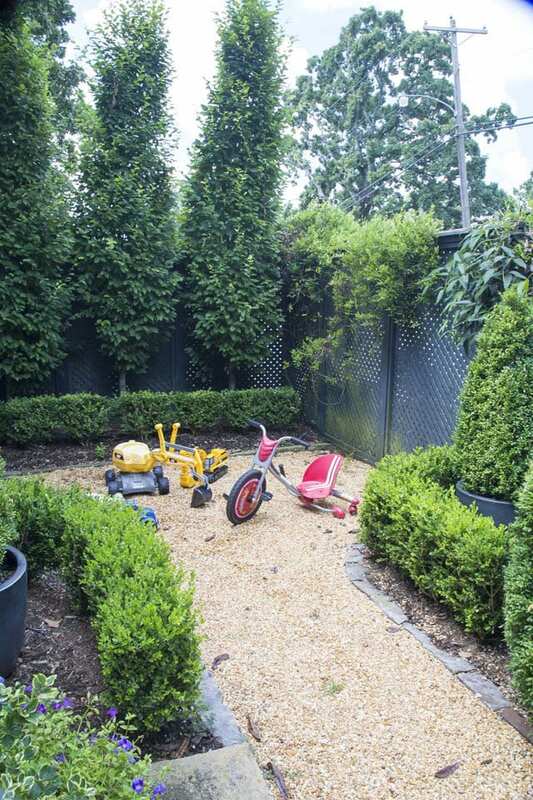 We planted boxwood hedges for partial ‘walls’ because they’re easy to maintain and prune. The beds behind aren’t fussy and planted, even. Just the occasional perennial or shot of color and potted evergreens. Remember, your kids will be their energetic selves here, and lots of objects may end up tossed over these (short) hedges. Make it easy on yourself to retrieve them. The area at the back is sharply defined, and we chose these hornbeam trees for a bit of vertical thrill. The space is welcoming to children, well thought out, and is an example of the old adage, form follows function. The backyard is small, but we used every inch of it as a space for growing children and plantings. Scale is critical to success of any design. 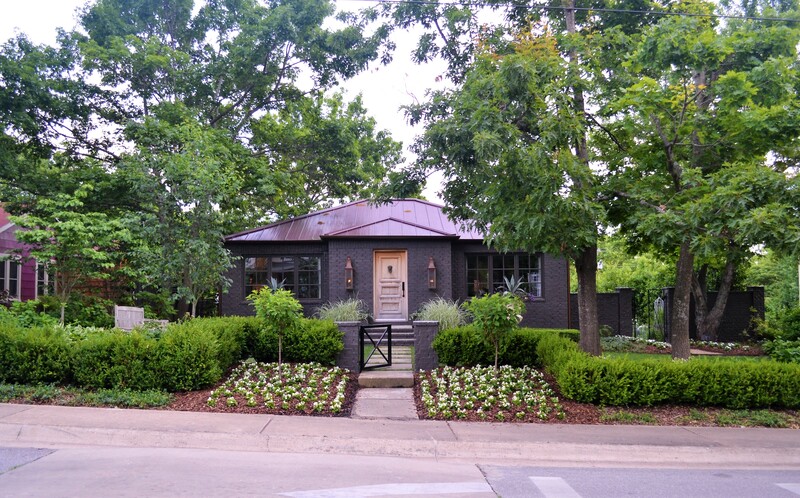 We kept the front bed simple with hostas and a Japanese maple that, even at maturity, will fit the space nicely. 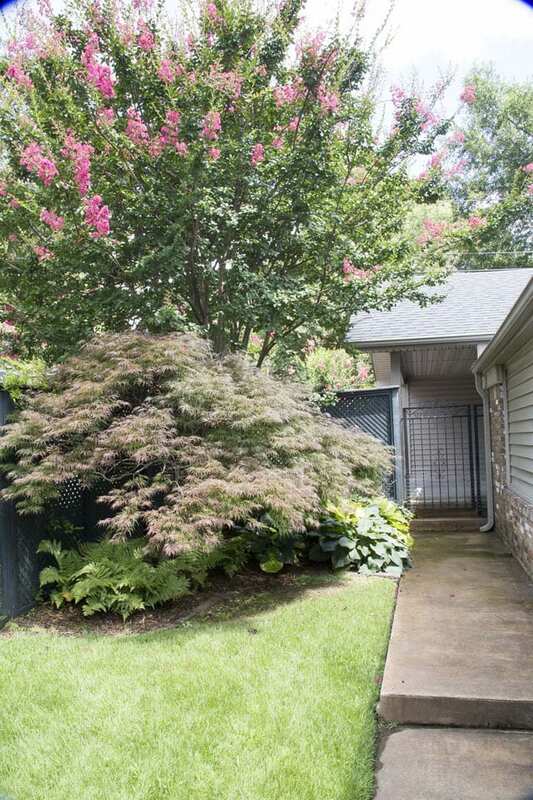 A crape myrtle stands sentry behind and, while tall and commanding, doesn’t interfere with anything below. And, yes, you can have grass here because the play space is out back. We used every inch of space, yet it doesn’t feel cluttered or out of sync. Narrow spaces can also be welcoming places. And perhaps there’s even room for the adults to toss a Frisbee, or play a bit of touch football here. It’s called using what you have. 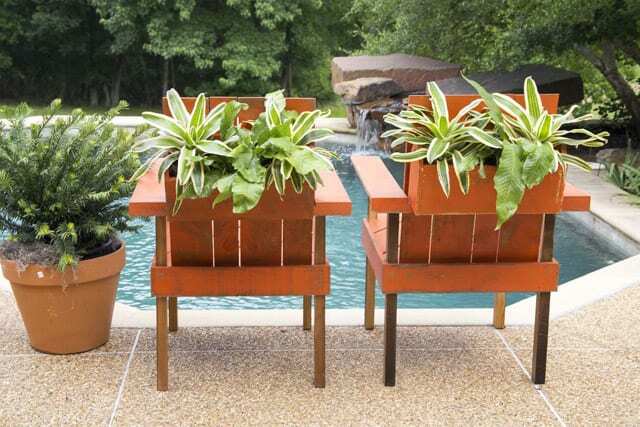 Just a little planning and planting material that lends itself to your design, and doesn’t overpower it. 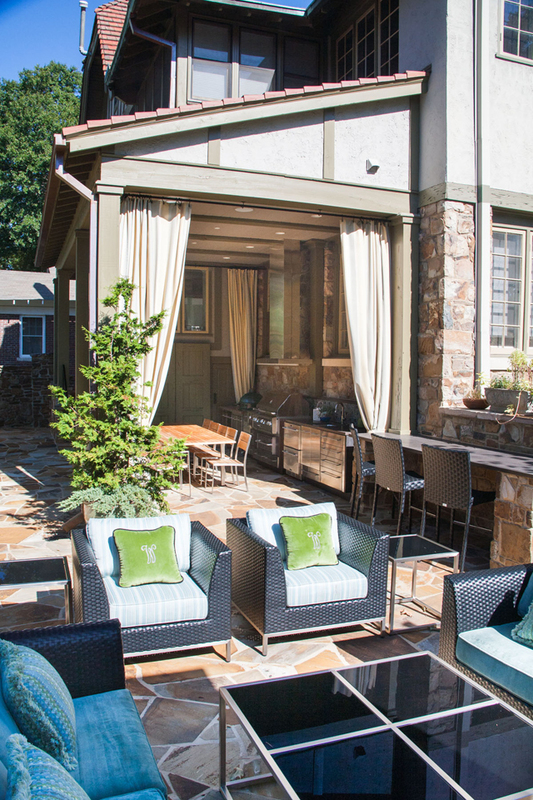 It really can be easy to extend your living spaces to the outdoors, and have fun at the same time.